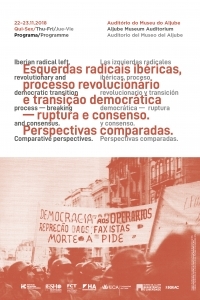 Iberian Radical Left, revolutionary and democratic transition process – breaking and consensos. Comparative perspectives. doctrinairism, accentuating disagreements and multiplying in small and large divisions. The fall of the Iberian dictatorships gave them processes of reconfiguration and growth that allowed them an intervention that has been historically devalued. This Colloquium seeks to re-examine, in a comparative perspective, its role in the processes of democratic transition. Languages ​​used: portuguese and spanish. Free entry, subject to room stocking.